The Buhari Media Organisation has said Senate President Bukola Saraki is the biggest loser in the 2019 general elections because he has lost so much in the power equation and is fast on his way to political extinction. The Pro-Buhari group described Saraki as a perennial political schemer who had suddenly lost relevance and therefore frustrated. 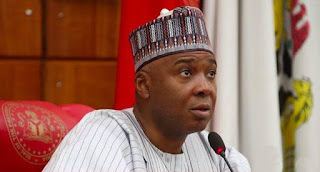 In a statement signed by its Chairman, Niyi Akinsiju and Secretary, Cassidy Madueke, the BMO said Saraki’s comment that the victory of President Muhammadu Buhari in the 2019 presidential election would be short-lived could only be described as the ranting of a politically expired person. “We consider the unpatriotic outbursts of Saraki as proof of a man who is frustrated after losing his political constituency as a senator, lost his bid to maintain a political empire, as well as his attempts to impose his lackeys on the good people of Kwara State. Describing Saraki as a political schemer, the BMO said he had finally played himself into political irrelevance as his constituents had become wiser and given their support to the All Progressives Congress. We at Boomreporters.com are ready to help you by bringing the latest happenings around the globe to your finger tip. Get All The Latest Updates Delivered Straight Into Your Inbox For Free! BoomReporters.com is an outstanding, groundbreaking news website that encourages citizen journalists to report ongoing corruption and government malfeasance in Africa. Using photos, text, and video dynamically, the site informs and prompts concerned African citizens and activists globally to act, denouncing officially-sanctioned corruption, the material impoverishment of its citizenry, defilement of the environment, and the callous disregard of the democratic principles enshrined in the constitution. Call +2347064708150, +234 814 (375) (6233). With substantial reach and mobility across the 36 states of Nigeria, 159 Countries ,we are always where the news is. For over three decades, BoomReporters has evolved an efficient and effective news gathering network of professional correspondents and world class information gathering system for credible , unbiased and authoritative news as it breaks.